Difference between revisions of "Blackhand Gorge State Nature Preserve"
This narrow east-west gorge was cut by the Licking River. Oak-hickory, Virginia pine, and mountain laurel grow along the hilltops, while yellow birch, cherry birch and eastern hemlock grow on the northern exposures. 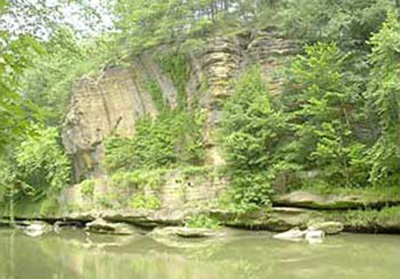 Blackhand Gorge State Nature Preserve is located in Licking County, Ohio. Controlled by the Ohio Department of Natural Resources, Blackhand Gorge State Nature Preserve is one of Ohio's most popular natural history attractions. Water, principally from the Licking River, slowly eroded away Black Hand Sandstone, creating the Blackhand Gorge. Sandstone is a very porous substance and much more susceptible to erosion than many other types of rocks. Cliffs, standing several hundred feet in height, exist on two sides of the gorge. A walking and bicycle path, the only bicycle path in one of Ohio's nature preserves, runs along the top of one of the cliffs. While Blackhand Gorge resulted from the erosion of Black Hand Sandstone, the gorge was not named for the sandstone. According to legend, an Indian petroglyph, which was in the shape of a hand and colored black, once existed on the gorge's northern wall. Several theories exist for why Ohio's native people carved the hand into the cliff. The most accepted explanation is that the hand was a message to various tribes that passed through the gorge that they must travel in peace. Unfortunately, construction of the Ohio and Erie Canal resulted in the petroglyph's destruction in 1828. The Central Ohio Railroad also ran through the gorge along the Licking River's edge. The first train passed through the gorge in 1851. In 1903, an interurban line also opened through the gorge, connecting Granville, Ohio, Newark, Ohio, and Zanesville, Ohio. The last interurban car traveled through Blackhand Gorge in 1929. In 1975, the State of Ohio formally established the Blackhand Gorge State Nature Preserve. The preserve consists of 956 acres of land.